The vineyards of Domìni Veneti are located in the hills of the Valpolicella Classica area with one-of-a-kind soils, microclimate and variety, so much so that the wines produced there have been recognised as DOC since the seventies. Amarone Espressioni is a box set consisting of five different types of Amarone, each representing a different valley of the Valpolicella Classica area: Villa, Marano, Fumane, Mazzurega and Monte. Amarone Espressioni is above all the synthesis of the Domìni Veneti philosophy, the result of a research project that has lasted over 10 years and conducted in collaboration with the Experimental Institute for Winemaking in Conegliano Veneto and the Winemaking Centre of the Province of Verona. 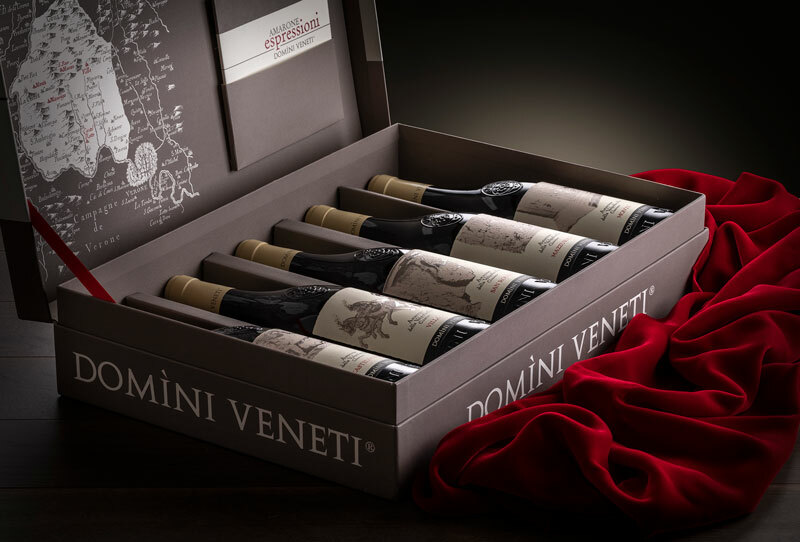 For years Domìni Veneti has been engaged in research and development of the territory, thanks to its fortunate success. Located in the heart of the Valpolicella Classica area, it owns vineyards in all five historic municipalities of the area: Negrar, San Pietro in Cariano, Sant’Ambrogio, Fumane and Marano. This project takes us beyond the meaning of Amarone, mainly characterised by drying techniques and native vines, to emphasise the different territories: new and unknown values to base originality and future competitiveness on. The grapes of this Amarone come from the vineyards of San Pietro in Cariano, the last municipality of the Valpolicella area to the south. Although mainly flat, it has some hills, the most important of which is Castelrotto (172 metres above sea level). Amarone Castelrotto is a dense, compact red, with a complex, ethereal and almost feminine nose. It has a soft taste, velvety tannic. It is truly perfect with meat, its ideal pairing. The hilly part of Negrar valley, which starts at a height of about 90 metres above sea level, is characterised by clayey-loamy soil and delimits the valley with two ridges, one to the east and one to the west. The vineyards and grapes of Amarone Villa grow on this rich and strong soil. Amarone Villa has a dense, compact red colour. It has a strong aroma with a tantalising note of cherries preserved in alcohol and black pepper. Its important flavour makes it excellent for contemplation and to enjoy with guests at the end of a meal. Marano valley is characterised by volcanic basaltic soil known as toar. The vineyards’ predominant location in the valley is at an altitude between 300 and 400 metres above sea level, which equates to strong autumn temperature variations. All this is the lifeblood of the vineyards giving rise to Amarone San Rocco. Amarone San Rocco is perfect for pairings with red meats and strong cheeses. It is an intense red, with an aroma accentuated by delicate notes of cloves. An Amarone abounding with personality! Sweet grapes are grown in Mazzurega, which when worked with skilful patience become the precious Amarone Mazzurega. In this area the vineyards are 60% in the foothills and the remaining 40% in the hills, with an average altitude of 200 metres above sea level. The soils here are made up of stratified sandstone-limestone rocks. Amarone Mazzurega has a dense, compact red colour. Its nose offers a complex bouquet with clear notes of tobacco and leather and the taste of black spice. Keep it for celebrating the most important occasions! There is a wide area cultivated with vines in the municipality of Sant’Ambrogio, both in the plains and in the foothills; the average altitude of the vineyards is about 180 metres above sea level and varies from 120 metres to 450 metres in the hamlet of Monte. The limestone soils are of sedimentary origin. Amarone Monte is dense and compact garnet-red, with a full and intense bouquet with hints of very, very sweet red jam. It has a soft taste, velvety tannic. If you love aged cheeses with a strong flavour, this Amarone pairs perfectly with them.